The JAY® Zip™ is a lightweight, anti-microbial and adjustable back designed to provide posterior and mild lateral thoracic support for active kids! The comfortable and soft outer cover offers a unique benefit: it's antimicrobial. The X-static fabric is impregnated with silver, which studies have shown actually inhibits microbe growth. This same material is also used in bandages, hosiery, and footwear to name a few. The outer cover is black as standard, and additional spares covers in pink or blue can be purchased. 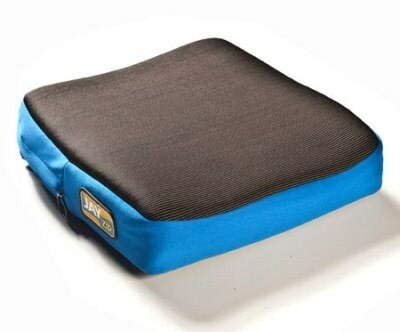 A dual layered contoured foam base, and a soft, stretchable outer cover create a very comfortable ride for kids. The 3DX spacer fabric in the outer cover also promotes air movement to prevent heat and moisture build-up.